The catalyst for World War One was the June 28th, 1914, assassination of Archduke Franz Ferdinand, providing the Austro-Hungarian leaders with the perfect opportunity to strike back at the various forces attempting to tear down their empire. Austria-Hungary entered the war on a poor footing, facing major Russian advances from the East and finding themselves unable to progress against the Serbians, who they blamed for the assassination. Things went from bad to worse as the war went on, and the German Empire began to exert more control for the aid they provided. 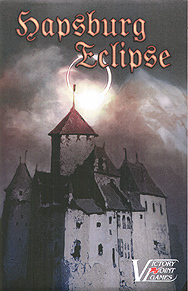 Hapsburg Eclipse is a stand-alone solitaire States of Siege game set in Eastern Europe during World War One (1914-1918); the player controls the leadership of the Austro-Hungarian Empire in an attempt to keep the Hapsburg Monarchy intact. Combined Game: Hapsburg Eclipse has a sister game, Ottoman Sunset, depicting the actions and downfall of the Ottoman Empire during World War One; the two stand-alone games can be combined as a two-player co-operative game and the rules for doing so are included within.